"Perfect beach read for "Eat, Pray, Love" fans looking for a little less eating and praying." "For adventure guide Jamie Hyde, the infamous nightclub bombing in Bali was more than a news story. While dining nearby, Jamie witnessed firsthand the explosion and the horrors of the blast’s aftermath. After helping to rescue several victims, Jamie herself was rescued by fellow diner Gabe Winters, who subsequently played an important role in her recovery. One year later, Jamie returns to Bali to attend a ceremony marking the anniversary of the tragedy, hoping to find closure and to find and thank the man who saved her. In Bali, Jamie discovers a country still reeling from the brutal attacks. She also finds unexpected support from the wise guest-house owner Nyoman and from Bambang, a savvy street urchin who helps her find the elusive Gabe. Sussman has drawn a vivid, well-balanced portrait of a woman and a country working to recover from an unimaginable event and a very personal look at a global tragedy. This is a story of healing and redemption, of finding love in the most unexpected places, and of the importance of moving forward." "At its heart, The Paradise Guest House is a lovely little novel about human connection in the face of humanity at its very worst." 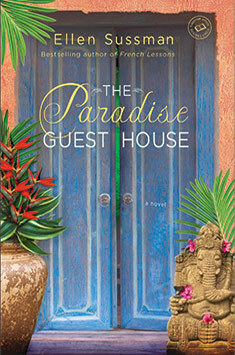 "The tranquil beauty of beachside Bali is the alluring backdrop for "The Paradise Guest House," and Jamie Hyde, a plucky and passionate adventure guide, is the delectable heroine at the novel's heart....with well-drawn, genuinely likable lead characters, it takes readers on an edgy island adventure over memorable emotional terrain."